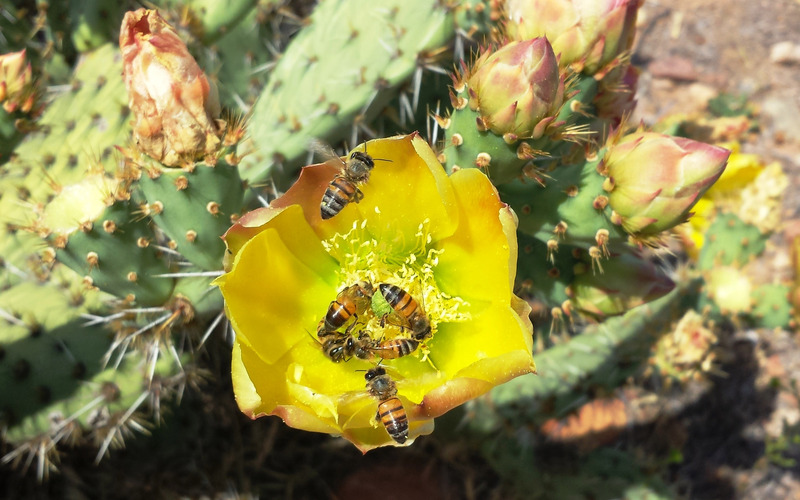 Non-native honey bees crowding at a flower of the native coast pricklypear cactus (Opuntia littoralis) in Southern California. An unprecedented study integrating data from around the globe has shown that honey bees are the world’s most important single species of pollinator in natural ecosystems and a key contributor to natural ecosystem functions. The first quantitative analysis of its kind, led by biologists at the University of California San Diego, is published Jan. 10 in Proceedings of the Royal Society B. The report weaves together information from 80 plant-pollinator interaction networks. The results clearly identify the honey bee (Apis mellifera) as the single most frequent visitor to flowers of naturally occurring (non-crop) plants worldwide. Honey bees were recorded in 89 percent of the pollination networks in the honey bee’s native range and in 61 percent in regions where honey bees have been introduced by humans. One out of eight interactions between a non-agricultural plant and a pollinator is carried out by the honey bee, the study revealed. The honey bee’s global importance is further underscored when considering that it is but one of tens of thousands of pollinating species in the world, including wasps, flies, beetles, butterflies, moths and other bee species. “Biologists have known for a while that honey bees are widespread and abundant—but with this study, we now see in quantitative terms that they are currently the most successful pollinators in the world,” said Keng-Lou James Hung, who led the study as a graduate student in UC San Diego’s Division of Biological Sciences. He’s now a postdoctoral researcher at the Ohio State University. The proportion of all floral visits contributed by the western honey bee in 80 plant-pollinator interaction networks in natural habitats worldwide. Honey bees are generally considered a native species in Europe, the Middle East and Africa, and introduced elsewhere. Honey bees are native to Africa, the Middle East and Southern Europe and have become naturalized in ecosystems around the world as a result of intentional transport by humans. While feral honey bee populations may be healthy in many parts of the world, the researchers note that the health of managed honey bee colonies is threatened by a host of factors including habitat loss, pesticides, pathogens, parasites and climate change. For instance, in San Diego, where honey bees are not native, they are responsible for 75 percent of pollinator visits to native plants, the highest honey bee dominance in the set of networks examined for any continental site in the introduced range of the honey bee. 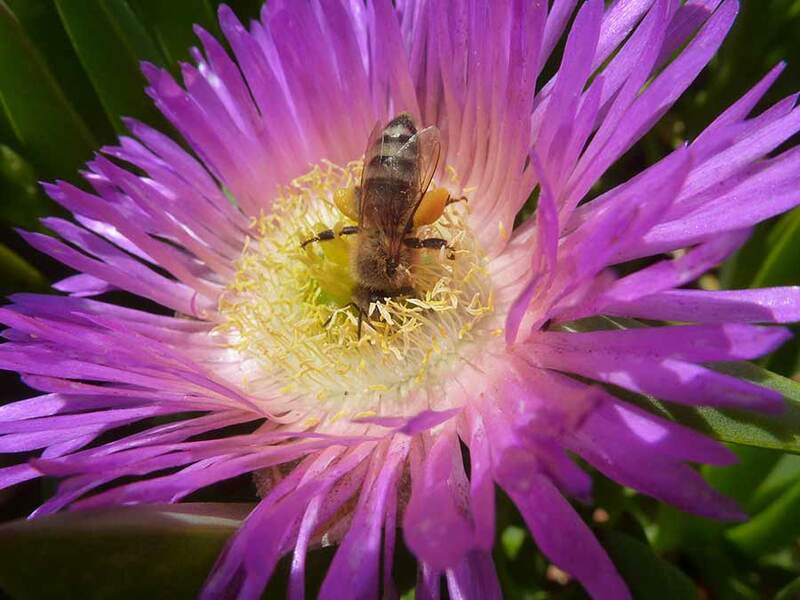 This is despite the fact that there are more than 650 species of native bees in San Diego County as well as many other native pollinating insects. “The consequences of this phenomenon for both native plants that did not evolve with the honey bee and for populations of native insect pollinators is well worth studying,” said Joshua Kohn, the study’s senior author. “Our study also nicely confirms something that pollination biologists have known for a long time: even in the presence of a highly abundant species that pollinates many plant species, we still need healthy populations of other pollinators for entire plant communities to receive adequate pollination services,” said Hung. The reason for this, Hung noted, is that in habitats where honey bees are present, they nevertheless fail to visit nearly half of all animal-pollinated plant species, on average. “Our take home message is that while it’s important for us to continue to research how we can improve the health of managed honey bee colonies for agricultural success, we need to further understand how this cosmopolitan and highly successful species impacts the ecology and evolutionary dynamics of plant and pollinator species in natural ecosystems,” said Hung. Coauthors of the study include Jennifer Kingston of UC San Diego and Matthias Albrecht of Agroecology and Environment, Agroscope, Reckenholzstrasse, in Switzerland. Funding for the study included a National Science Foundation Doctoral Dissertation Improvement Grant (DEB-1501566); a Mildred E. Mathias Graduate Student Research Grant and an Institute for the Study of Ecological and Evolutionary Climate Impacts Graduate Fellowship from the University of California Natural Reserve System; a Frontiers of Innovation Scholar Fellowship, an Academic Senate Grant and a McElroy Fellowship from UC San Diego; a Sea and Sage Audubon Society Bloom-Hays Ecological Research Grant; and a California Native Plants Society Educational Grant.